If there’s one thing kids love, it’s literally ANYTHING with their name on it. I was the same way as a kid. 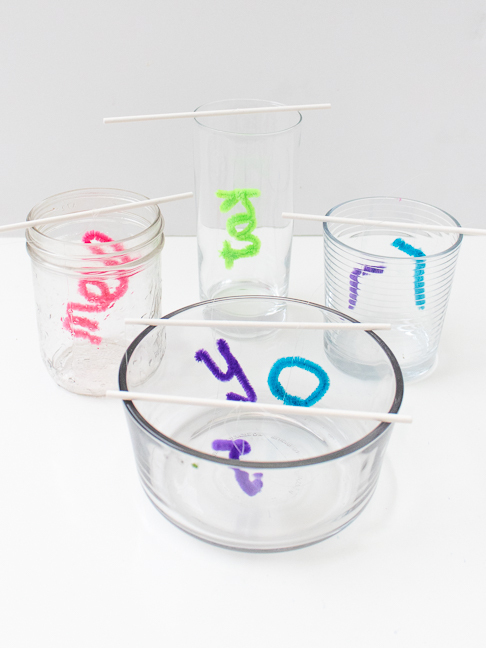 You can help your kids grow their own personalized DIY crystals in less than one day using pipe cleaners and Borax! This easy trick will keep kids mesmerized for hours as they watch the progress of their growing DIY crystals. Once they’re complete, each one is unique, colourful and hardened for durability. What better way for them have a personalized trinket with their name on it than for them to make it themselves? 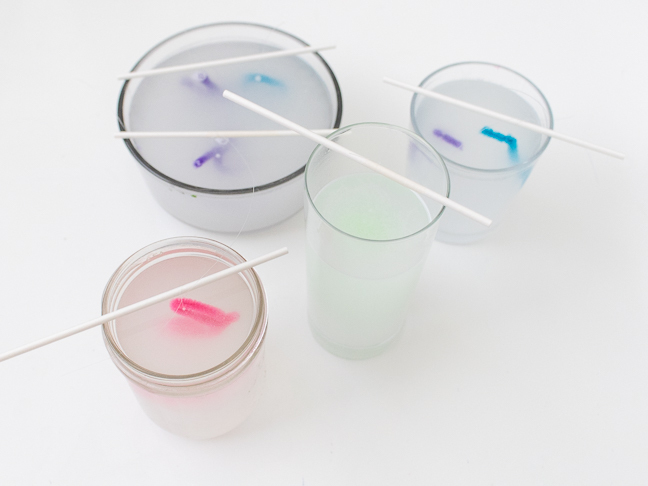 Alternative option: Use white pipe cleaners and dye the water with food colouring for pale coloured crystals. Step 1: Wrap pipe cleaners into letters or names. For longer names, you can simply join multiple pipe cleaners together and twist into cursive. Step 2: Attach fishing line to each individual pipe cleaner and suspend from sticks placed over containers. Pipe cleaner should not be touching each other or the bottom of the container. They must be low enough that water will be able to cover them completely. 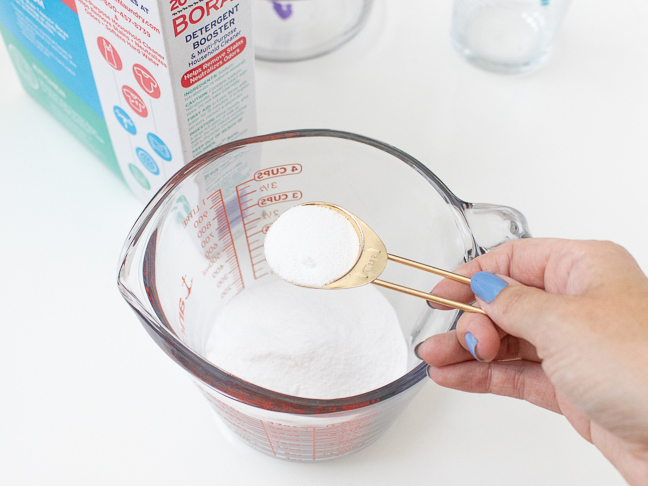 Step 3: Measure 3 tablespoons of Borax for every one cup of hot water. Measure very hot but not necessarily boiling water. 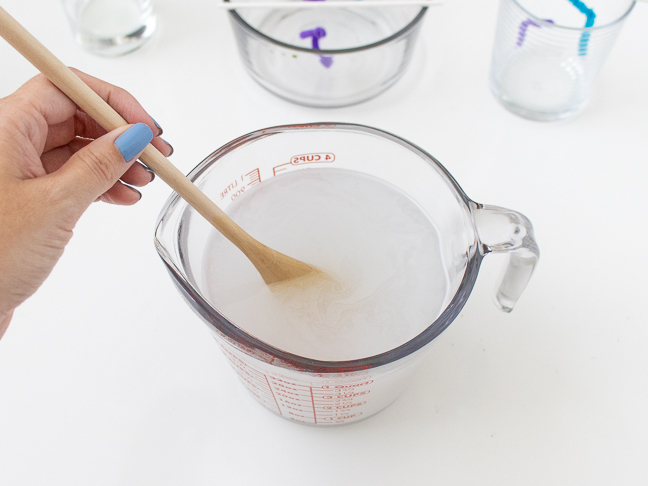 Mix well until the Borax completely dissolves. You will need to repeat this step multiple times to fill multiple containers. For safety, help kids with this step so they do not burn themselves! 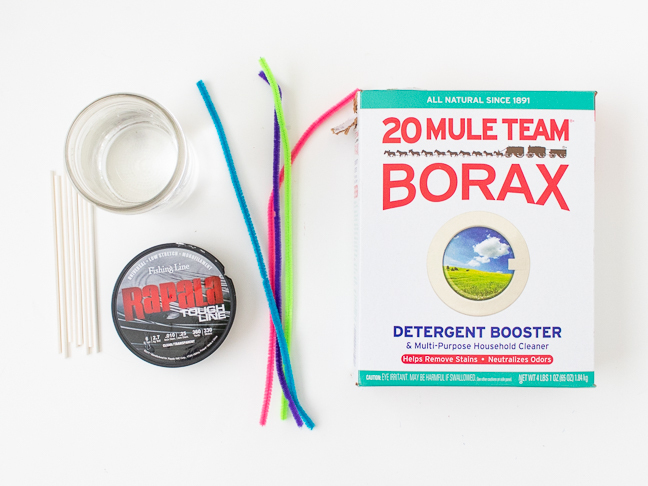 Step 4: Pour the Borax mixture into each container until the pipe cleaners are completely submerged. They might float up a little but should stay covered. Set aside for about 6 hours. Kids can check occasionally (water will begin to clear up quickly) to watch the progress as the crystals grow! Step 5: Once you’re satisfied with crystal growth, remove the crystals to dry on a paper towel. 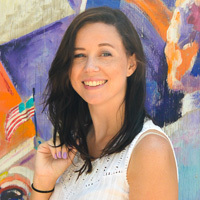 Cut away the string – crystals may have grown around it so you can’t pull it out. These crystals are hard, durable and vibrant! Kids will love playing with them or displaying them in their rooms.